Photovoltaic (PV) Solar Laminate strips are an innovative product offered exclusively by Metalcraft Solar to complement its espan470 roof system. This is an alternate form of technology, which comes in the form of a flexible strip with an adhesive backing that adheres directly to the roof surface. 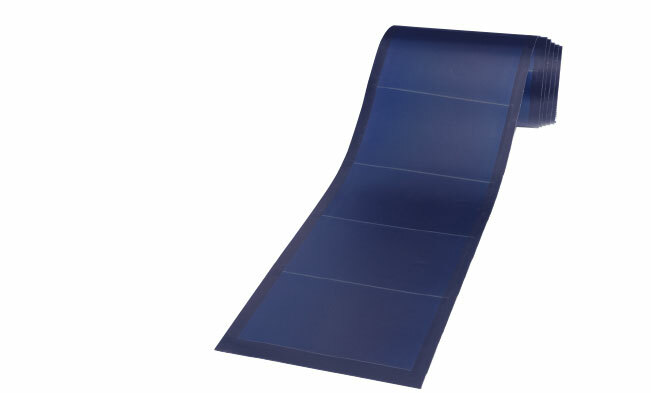 Because the height of a strip is only 2.5mm and sits directly on the pan of the roof sheet, this technology offers significant aesthetic benefits as the array becomes virtually invisible on the roof in contrast to conventional solar modules that are mounted on a rail system atop the highest point of the roof profile. On a dark coloured roof they are usually very hard to spot from the ground at all because the vertical ribs of espan conceal them; yet there is sufficient clearance from the ribs to minimise the risk of shade affecting output. This is only compatible with Metalcraft’s espan470 roof profile as the substrate must be flat with no swages to achieve best adhesion and to prevent water ingress under the strips. In order to validate your NZS warranty, MAXX grade paint finish is necessary. The standard module we carry is the recently released Third Generation of this product, which is a 290Watt module, 348mm wide and 5,910mm in length. Therefore, allowing for clearance from the eave line, a 6.0m roof sheet length is the minimum for this product. However, we are now adding a new shorter module to the range. The width is the same but is 2,585mm in length, and 125Watts per strip. Although it is a lesser wattage, homes with shorter roof sheet lengths are suitable for PVL Solar solution, and also affords the option to mix and match’ on roofs that could accommodate both lengths in different areas. Cabling is run in a cable tray that sits under the ridge or head barge flashing which gives the pre wired junction box and cables weather protection, so it is important to make allowance for the cable tray to sit between the heads of the sheets (Refer to install details). The PVL product is know to perform better than conventional framed modules in flat pitch applications, and similarly in a vertical setting, so it can also be used as a wall cladding to present a Building integrated PV (BIPV) solution. The PVL’s are more expensive than conventional modules purely due to economies of scale in production, but that is offset in part by eliminating the cost of mounting hardware necessary for framed modules, and this means they are much faster to install. Other advantages include the fact that they are significantly lighter than conventional options (2.09kg/m2 vs. 11.36kg/m2); and have superior wind resistance properties being completely flush with the roof surface. This product is supported by Metalcraft’s standard 5-year workmanship warranty, and also a 10/25-year output warranty which means 90% output after 10 years and 80% output for the following 15 years. The strips cannot be modified/shortened, and cannot be draped over a ridge. They are incompatible with Micro inverters.